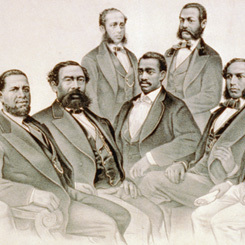 Image courtesy of Library of Congress In the first two Congresses following the ratification of the Fourteenth Amendment, seven African Americans were sworn in as Members of Congress: Robert DeLarge, Jefferson Long, Hiram Revels, Benjamin Turner, Josiah Walls, Joseph Rainey, and Robert Elliott. On this date, President Andrew Johnson submitted to Congress his veto of the Omnibus Southern States Admission Bill (H.R. 1058). The measure was a significant piece of Reconstruction legislation that set stringent guidelines for allowing Southern states to rejoin the Union and send Representatives to Congress. Among its provisions was a requirement that Southern states ratify the 14th Amendment, which was intended to protect citizenship rights of African Americans. The Constitution permits Congress to override a presidential veto by two-thirds majorities in both chambers. After receiving news of Johnson’s veto, the House resolved without debate to vote on the measure, passing it by a vote of 108 to 32, with 54 Representatives abstaining. Following the House, the Senate also swiftly approved the bill by the necessary two-thirds vote, effectively overriding the veto. In all, President Johnson vetoed 29 pieces of legislation during his long struggle with congressional Radical Republicans over the shape of Reconstruction policy in the South. Congress overrode 15 of those vetoes.